Deletion of zeros may enter (donkey dinar) in solve corruption largest! 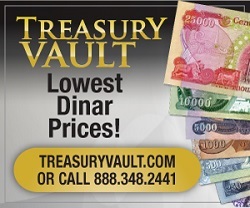 Bond Ladys Corner » NEWS FROM IRAQ » Iraq Dinar & CBI News » Deletion of zeros may enter (donkey dinar) in solve corruption largest! Baghdad: described the MP for the Iraqi List, Iman Moussa told the parliamentary economic committee the fact that the deletion of zeros facilitates theft billion without the knowledge of the government, as the statements are exaggerated, calling all parliamentary committees to take it upon themselves to the supervisory role and Legislative without intervention work Executive, because he is difficult. She said in an exclusive statement to (East): "The process of deletion of zeros came proposal from the Central Bank, and including that prestigious institution, they are responsible for the project to delete the zeros as a proposal professional." Explained Moses: "The idea to delete the zeros of the Iraqi currency professional, but they need to sufficient capacity to draw such a policy for the future of the country's economic. "she said:" The Central Bank economic institution, who paints country's policy cash. This decision came via meetings with the Council of Ministers and all those responsible. "and stressed that" the country is in a crisis since 1991 , year in which the add zeros to the Iraqi currency. "In a related development MP for the Liberal bloc Abdul Amir Kassar that the deletion of zeros from the Iraqi currency at the present time is a positive, noting that this procedure will lead to chaos financial, economic and political. said in a statement special (East): "The process of deletion of zeros at the moment is successful, because the country is now going through a political and economic crisis, so this process needs to be a more stable country and only the process will lead to chaos can not be processed." He was a member of the Economic Commission parliamentary Hussein Mura'bi, has said that getting lost in the monetary policy makes the country lose about eight million dollars a year, while warning that the issue of deletion of zeros will facilitate the mafia money laundering steal billions without feeling state, called to examine the impact on the overall situation.